Cairde is a new and exciting service from Muintir na Tíre. Designed for use by community groups, it empowers communities to become safer and more connected than ever before. 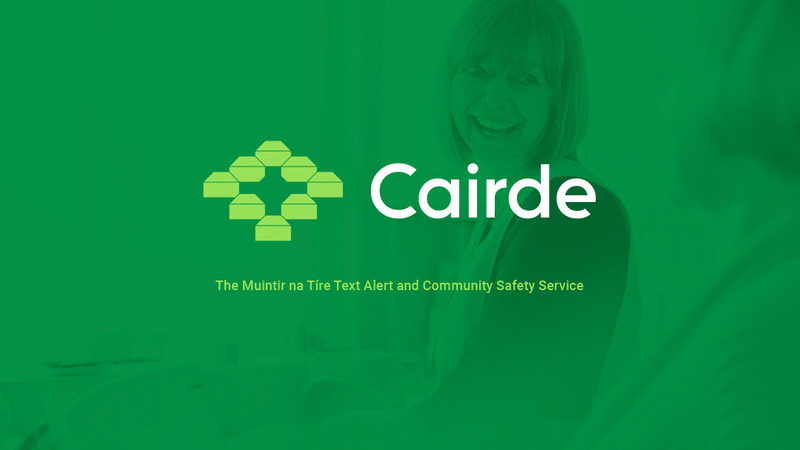 In response to the needs of their members and communities all over Ireland, Muintir na Tíre have integrated state-of-the-art, modern technology with the current community text alert system to create Cairde, the most effective community safety service available today! Watch the Video below to see a simple explanation. Cairde is simple and intuitive to use. First you will need to download the app to your smartphone and register for the service. Every member has their “Cairde”. These are a small group of local people who have agreed to come to your aid if you issue an emergency alert. You can send unlimited messages to your Cairde or community group and you can receive unlimited messages from your Cairde, community group and Muintir na Tíre. In an emergency you can use the smart monitored panic button to send a panic alert to your Cairde and the Gardai. Our system monitors and coordinates all responses. Both you and all those responding to your alert will be continually informed about who is coming and how far away they are until the issue is resolved. This means nobody feels isolated or alone while dealing with emergency situations. Receive unlimited Garda text alerts which advise of suspicious or criminal activity in your area. The Cairde app makes it easy for you to filter what kinds of messages you want to receive. With Cairde security cameras you will be able to monitor your home directly from your smartphone. With the Cairde doorbell camera you will be able to see, hear and speak to anyone at your front door from anywhere in the world using the Cairde app on your smartphone. If you need help you will also have the Cairde panic button to get help immediately from local people and the Gardai. Other cameras simply alert you that you have a problem. Cairde alerts you and gets you an immediate response to your problem! Many people worry about loved ones who live alone. They want to ensure their safety while still respecting their independence and privacy. With Cairde you can! By simply placing a Cairde smart plug on your loved ones kettle you will be alerted if they fail to put the kettle on in the morning or change their normal pattern of behaviour with the kettle in any significant way. With your Cairde close by you will have someone ready and able to help immediately. Cairde communities will be able to see exactly what is going on in their neighbourhood. With Cairde analytics we will be able to tell members the numbers of alerts being generated in their neighbourhood and the kinds of events taking place. The more informed you are about what crime is taking place the better placed you are to deal with it. If you need help downloading an app to your phone, iPhone users click here, Android users click here. Connected communities are safer communities. Cairde helps coordinate swift responses to personal safety issues at home. Other security systems tell you that you have a problem. The Cairde Panic Button is designed to solve your emergency by enabling the quickest response possible from local friends, neighbours and Gardaí. Cairde ensures people stay connected, helping them to feel less alone and less afraid. Cairde is simple to get, simple to pay for and simple to use, yet it is still provides the most effective protection possible to members and their communities. In response to the huge number of requests from our members Muintir Na Tíre is delighted to announce that Cairde will be pay by text. This means members will simply have to send a text message from their phone to pay for Cairde. The annual subscription fee of €10 will then simply be added to your phone bill for that month, your payment date for your phone bill will not change. Pay as you go customers will simply have the money deducted from their balance. This allows members a simple and transparent way to pay for the service. This also means no more calling to doors to collect money from community members! Muintir na Tíre strongly recommends all groups to upgrade to the Cairde service now so they can avail of all the extra benefits only available to Cairde members! If you are currently a BeAlert customer, formerly Grapevine, you can use Cairde immediately. If you are currently a customer of Pinpoint Alerts or Sendmode you must contact us using the form below and we will instruct you how to upgrade to the Cairde service. If you are a committee member of a community group and would like a one page printout about Cairde to hand out to your members click here. If you are not a member of a group but would be interested in getting a community text alert service in your area you can find out more information from Muintir na Tíre here. If you have any further questions on Cairde we have provided a comprehensive list of Frequently Asked Questions which you can access via the button below. They cover how to get started with the Cairde service, how it works as well as pricing and support. If your group requires more information or help we will be happy to meet with them. To arrange a meeting simply contact us clicking the button below and filling out the form. If you are interested in starting a Community Text Alert Group for your area you can register your interest by filling in this form. If you need further support or have a question not covered in our FAQ section you can get in touch with us directly by using the button below and filling out the form.